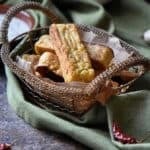 Home » Appetizers » Chickpea Flour Sticks: Spicy,Gluten free and Vegan! These Chickpea Flour Sticks were a recent discovery for me, but an automatic hit! An easy-to-assemble, spicy, gluten-free and vegan appetizer made with simple ingredients. My daughter actually introduced the idea of this recipe to me just a few weeks ago. She was talking about some travelling that she had done this summer, and mentioned the “chickpea fries” that she had tried when she was in Vancouver. She described the ingredients to me, and how to make it, and I just knew I had to try it out! Making it with her made for a fun and relaxing morning, and at the end of it all, they tasted just fabulous. 1 – A wonderful finger food! 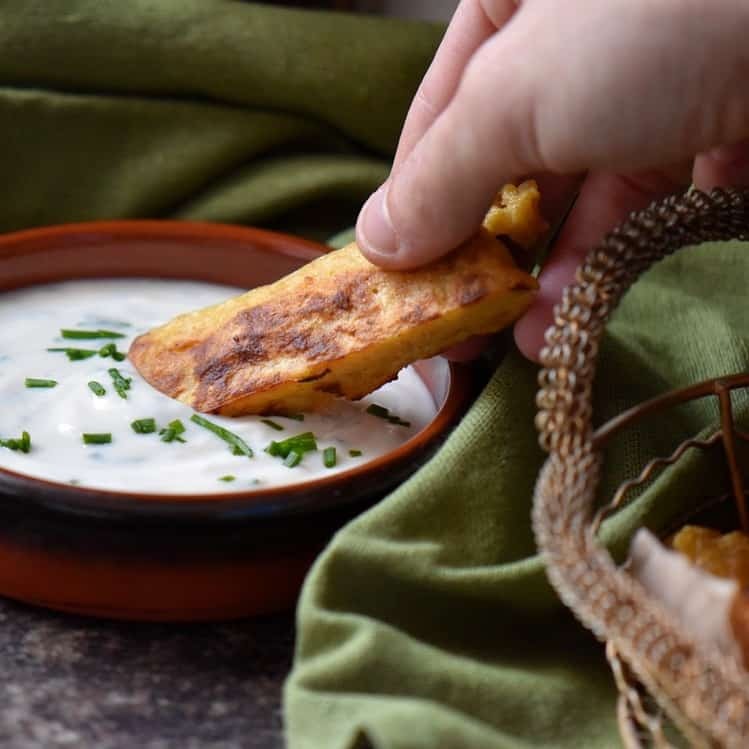 I love serving good appetizers at a party, and these Spicy Gluten Free Vegan Chickpea Flour Sticks certainly fit the bill! Served with this Homemade Garlic Yogurt Sauce (recipe for that coming soon! ), these little treats will certainly be gone in an instant any time you have family or friends over! 2 – The ingredients! You only need six ingredients to make these delicious little sticks, five of which I’m sure you already have on hand: salt, pepper, red chili flakes, garlic, and olive oil. The sixth ingredient is chickpea flour, which you can find in the health or gluten free sections of your grocery store. Did you know that chickpea flour is gluten-free? Basically, it is the result of grinding chickpeas, either roasted or raw. As far as the texture is concerned, it kind of resembles cornstarch but with clumps. 3 – The flexibility in taste! This recipe for these Chickpea Flour Sticks has a medium amount of spice, but you can add more or less red chili flakes to suit your needs. I personally have a pretty low tolerance for very spicy foods, so when I make these for myself, I use less red chili than I indicated below. But when I make them for my daughter, I add a little more. It’s all up to you! 4 – The flavor! You would think that a recipe that had so few ingredients would probably be on the “simple” side of the taste spectrum. But I have found that these Spicy Gluten Free Vegan Chickpea Flour Sticks pack a surprising punch! These appetizers have a complex, savory flavor that took me completely by surprise the first time I tasted them. 5 – The assembly! There is nothing to it! I will go into details a bit further down in the post, so I don’t want to repeat myself, but really, it couldn’t be a simpler appetizer to put together. 6 – Appropriateness for guests with different dietary restrictions! 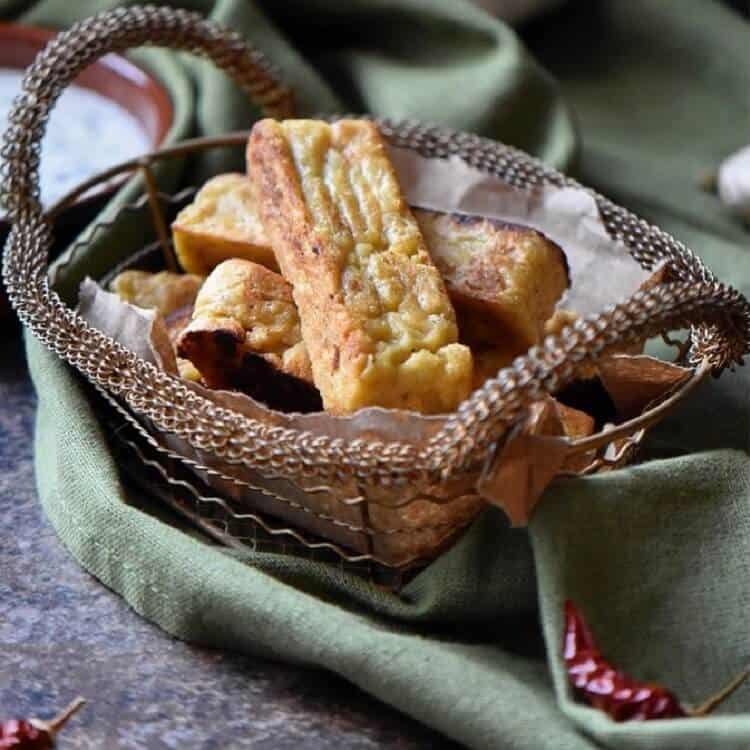 These Spicy Gluten Free Vegan Chickpea Flour Sticks can be enjoyed by individuals with different dietary restrictions, which makes it the perfect party food when entertaining lots of guests. 7 – The healthiness! Chickpea flour is a good source of protein, iron, and dietary fiber. And since I pan-fry my Spicy Gluten Free Vegan Chickpea Flour Sticks (rather than deep fry), the sticks stay as light and healthy as can be. These little treats are perfect in so many ways, and are so easy to assemble as well. As promised, let me walk you through the process of making them. As I mentioned, only 6 ingredients are needed to make these Spicy Gluten Free Vegan Chickpea Flour Sticks: salt, pepper, red chili flakes, garlic, olive oil, and chickpea flour. Oh, and you’ll need water too! To begin with, bring the water to a rolling boil. Add the salt to the water. In the meantime, whisk the pepper, red chili flakes, and chickpea flour together. Mince the garlic and combine it with the dry ingredients. When the water is boiling, reduce the heat to the lowest setting. Slowly add the chickpea mixture into the water, and whisk continually. Don’t walk away from the mixture, even for a minute – just whisk! You need to whisk continuously until the mixture has the consistency of a thick porridge. This takes about 5 minutes. Your arm may get a little tired doing this, but the end result is worth it. 🙂 Try your best to minimize the clumps in the mixture as you whisk. Once you have whisked everything together, quickly pour the resulting mixture into a baking pan that has been lightly greased. Place the pan in the fridge until it sets, minimum 30 minutes. When the mixture has set, you are ready to start pan-frying! Cut the now-set chickpea mixture into rectangles roughly 1 inch wide. If you wanted, you can also cut them 1/2 inch wide in order for them to resemble thin home fries. Heat up one and a half tablespoons of olive oil in a non-stick pan on medium-high heat (If you recall, we used this same method to make these delicious Italian Potato Croquettes). Pan fry half the sticks, rotating them regularly so that all sides brown evenly. When all sides have taken on some color, you are done! Remove them from heat, set them aside, and continue pan-frying the remaining sticks. My daughter loves to travel. Thanks to modern technology, she is able to share her experience with all of us back home. However, there are some details that only got mentioned months later. For example, I knew that she would often meet and befriend other travelers, and that often, she would cook together with her new friends at their hostels. Like mother, like daughter! When she brought these times up, I would ask her what she made for everyone else. It never really occurred to me to ask what others made for her. A real shame too, because I could have discovered these Spicy Gluten Free Vegan Chickpea Flour Sticks much sooner if I had! 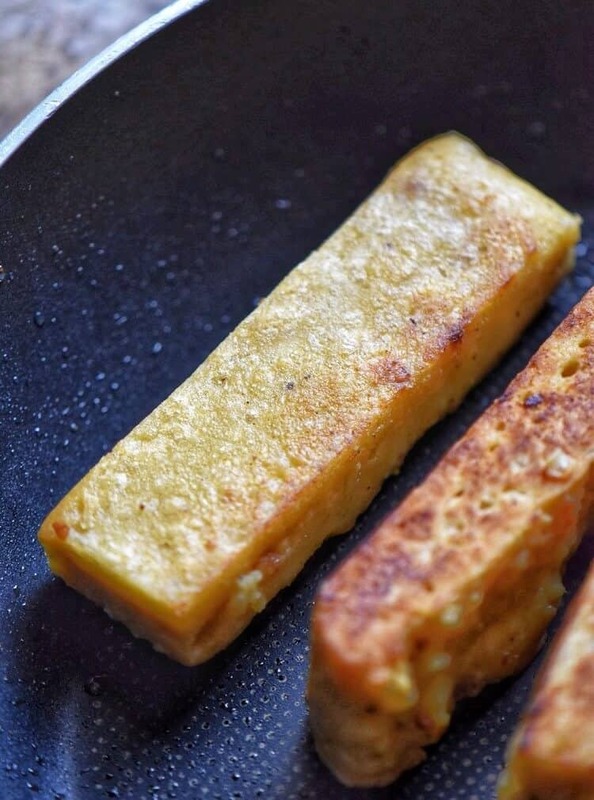 It turns out that these Spicy Gluten Free Vegan Chickpea Flour Sticks are actually a well-known finger food from the south of France called panisse. And according to my daughter, it was indeed a young woman from Nice who originally showed her how to make these. The hostel where my daughter and this young woman were staying had a kitchen, free for use, and was stocked with some basic ingredients. The young woman decided to make them panisse because the only ingredient she was missing for it – the chickpea flour – was very easily obtained in Vancouver, where the two were staying. Apparently, the recipe was passed down from the woman’s grandmother. She didn’t really measure anything when she made the recipe, just threw things in pinches and dashes. My daughter feels like the measurements we figured out together when we recreated the panisse make a similar end-product. I did my own research on panisse while writing this post. Imagine my surprise when I found out that before it reached France, it actually originated from the region of Liguria, in north-west Italy! I had never heard of any such dish. I guess that is unsurprising, given that my husband’s heritage (and mine) is from the south of Italy. Like I always say, the culinary traditions of Italy are extremely diverse for such a small country! These Spicy Gluten Free Vegan Chickpea Sticks are a rustic, flavorful, and healthy finger food. You can serve them as an appetizer at all your parties. They also make a great snack food during any events you have coming up! I recently made them for our New Year’s Eve celebrations, and will definitely be making them for the Super Bowl as well. 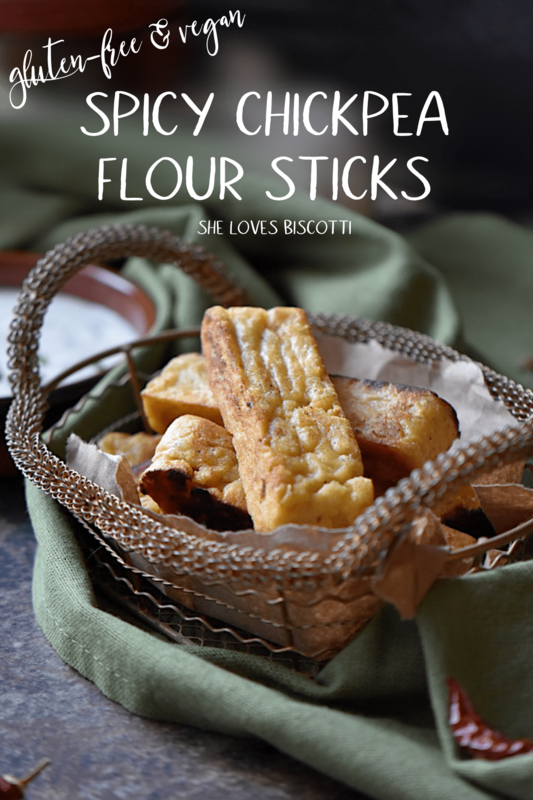 ★★★★★ If you have made these Chickpea Flour Sticks, I would love to hear about it in the comments below and be sure to rate the recipe! These Spicy Gluten free Vegan Chickpea Flour Sticks are a rustic, flavorful & healthy fingerfood -a great appetizer for your Super Bowl Party. Grease or line with parchment paper an 8 x 8 baking dish. Set aside. In a medium pot, add salt to the water and bring to a boil. In a large mixing bowl, add the spices and garlic to the chickpea flour and whisk together until no lumps are visible. Once the water is boiling, reduce to lowest setting and slowly add the chickpea flour. Whisk CONTINUOUSLY for about 5 minutes. Mixture will become thick. Pour the chickpea mixture in the greased or paper lined baking dish and spread evenly. Place in refrigerator for a minimun of 30 minutes. With a very sharp knife, cut in quarters. Then, cut lengthwise at 1-inch interval to obtain 16 sticks. "Pan fry" half of the chickpea sticks in 1 1/2 tablespoons of olive oil until golden on all sides. Repeat with other half. Transfer to dish and serve with favorite dipping sauce. There is an inactive time of 30 minutes while the chickpea sticks firm up in the refrigerator. You can also make smaller sticks -cut each portion again in half. These chickpea sticks can also be baked in the oven. I would rather bake these. Would you be able to let us know the over temperature, and how long it would take in the oven…? thanks. I’ve never worked with chick pea flour — but you certainly have me intrigued. Love this healthy, GF spin on an Italian classic. Beautiful recipe! Maria, I love cooking with chickpea flour and these remind me of Sicilian Panelle, although probably a bit healthier! It’s interesting to see how the different regions of Italy use similar ingredients but in different ways. Thanks for sharing!